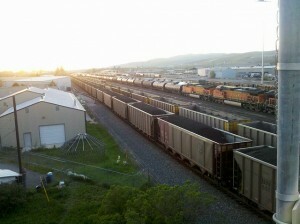 A coal train passes through Missoula on its way to other densely populated areas. Photo by Katie Brady via Flickr. On Sunday, people from across Montana, and the larger area affected by coal export projects, will start converging in the state capitol of Helena. They’re coming for what will likely be the largest act of nonviolent direct action related to energy policy the Northern Rockies region has ever seen. We’re calling it the Coal Export Action. By tapping into the type of nonviolent protests in other parts of the country this summer — such as the fights against mountaintop removal and fracking — our coalition of groups plans to challenge an energy project that threatens the health of communities across the Northwest: coal mine-for-export projects. Organizations involved in the action include grassroots groups like the Blue Skies Campaign (with which I’m an organizer), Bozeman Climate Alliance and Montana Women For; Occupy groups from Missoula, Helena and Bozeman; and local affiliates from national organizations like 350.org and Greenpeace. We’re coming together not only to address local health concerns related to coal exports, but to protect the global climate from one of the biggest carbon bombs moving forward anywhere in the world. A lynchpin in Montana governor Brian Schweitzer’s plan to shift the Big Sky State from an agricultural economy to energy extraction, coal exports center around energy companies’ bid to open vast new areas in Montana to mining. This has implications for communities along the Northwest’s rail line system, as well the planetary climate. If coal exports go through rural areas in eastern Montana, now dominated by agriculture, those areas would become industrial mine zones. Open-top trains carrying coal from mines would pass through towns in Montana, Idaho, Oregon and Washington on their way to proposed ports on the West Coast. From there, coal would be shipped to markets abroad. This has health, environmental and community activists worried. Dust and diesel fumes from up to 30 additional trains travelling to the coast and back each day present serious health concerns. A study prepared for the Western Organization of Resource Councils also suggests that projected increases in train traffic will create bottlenecks along the Northwest rail system — a headache if you want to transport agricultural products to the coast. During what has blossomed into a summer full of direct action against extraction nationwide, more and more Montanans have begun to question and openly challenge coal export plans. Some of us are motivated by local impacts, while others worry about climate change or agriculture. But most of us share a common concern that coal exports threaten to change Montana in fundamental ways, with national and international implications. Although it’s now a largely agricultural state — agriculture supports one in five Montana jobs — with potential to be a clean energy leader, Montana is poised become like West Virginia: an extractive economy staking its future on fuel of the 19th century. And because Montana has approximately a quarter of the nation’s coal reserves, this spells disaster for the climate, which is already reacting to a buildup of carbon in the atmosphere. Whether it is ultimately burned overseas or at home, coal is the dirtiest fuel in the world, and it contributes to both climate change and global mercury pollution. So, on August 12, Montanans will start gathering at the State Capitol to express moral outrage over coal exports. They’ll be joined by a smaller group of people from outside the state — mainly from communities in the Pacific Northwest, which will see increased coal train traffic if Montana coal mines are expanded. Next week, these people affected by the coal industry’s export plans will take action against extraction in a way not previously seen in Montana. Starting August 13, and continuing through the 20th, groups of people will participate in daily sit-ins in the State Capitol rotunda to protest the Montana Land Board’s complicity in coal exports by way of the coal industry’s “anchor project,” Arch Coal’s proposed Otter Creek Mine. By laying infrastructure needed to expand mining into other areas, Otter Creek would open the door to large scale coal exports. In 2010, the State Land Board voted three to two to lease Otter Creek to Arch Coal. That gave Arch the go-ahead to submit a mining application, which the company plans to do as soon as late summer. The Land Board must approve the plan before Arch starts mining, and as of now they’re almost certain to say yes — hence the urgency of this month’s sit-in. Years of more traditional advocacy — letter writing, public testimony and more — haven’t convinced state decision makers to side with communities over coal. Montanans have one last good chance to stop the Otter Creek Mine by ensuring Arch doesn’t get its final permit. But it’s an election year, and global energy companies are pouring money into public relations campaigns, trying to win over officials. Direct action against energy projects is still rare in Montana, but that is beginning to change on a large scale. Originally spearheaded by grassroots groups like the Blue Skies Campaign — a volunteer organization established last year in Missoula — the Coal Export Action coalition grew as national environmental groups started reaching out to members in Montana. The Occupy movement in Montana has also brought another dimension to the action, including ideas about social justice that are the bread and butter of Occupy groups nationwide. On the morning of August 13, the first group of activists will sit in the Capitol rotunda — between the offices of Governor Schweitzer and Secretary of State Linda McCulloch, both members of the Land Board — and decline to leave for the rest of the business day. The next day, a new group of people will do the same thing. And so on. There will be support and solidarity roles for those who don’t wish to join the direct action. Sit-in participants will be required to attend a nonviolence training — offered every evening August 12 to 19 — to prepare for a dignified and wholly nonviolent action. Parents and students, teachers and health professionals, together with business owners and workers, are expected to attend. This won’t be the last chapter in the fight against coal exports. The Montana Land Board likely won’t make a final decision about Otter Creek until sometime next year, and the review of Arch’s plan will just be getting started this summer. But next week’s action will spotlight the Land Board’s role in the fate of Montana’s coal country, from the very beginning of that review process. By using direct action, citizens will put a spotlight on elected decision makers in a way no letter-writing campaign could. Whether the Coal Export Action will sway the Land Board’s decision on Otter Creek still remains to be seen. But what’s certain is that Montanans are coming together to build a larger, louder and bolder movement against extraction of coal. Next week’s direct action is the first stage in that journey. Nick Engelfried is an environmental writer and activist. He currently lives in the Pacific Northwest.